University of Cincinnati architecture professor John Hancock’s passive solar design includes south-facing windows in the living and gallery rooms, center, and the master bedroom and lower-level professor’s studio, right. He and his artist wife, Marcia Alscher, believe their modern Clifton home will earn LEED platinum certification, the highest in the energy and environmental design program. John Hancock’s signature is all over his new house in Clifton. The University of Cincinnati architecture professor is used to jokes like that, but this may be the first time one hit so close to home. “It comes at me most times when I’m using credit cards,” said Hancock, who is no relation to the Declaration of Independence signer. Being able to use the home he shares with his wife, artist and former architect Marcia Alscher, as a place for them to work and live the rest of their lives motivated Hancock’s design decisions. The city of Cincinnati’s tax abatement program for new homes that achieve LEED (Leadership in Energy and Environmental Design) certification motivated Hancock and Alscher to go as green as possible with their design. 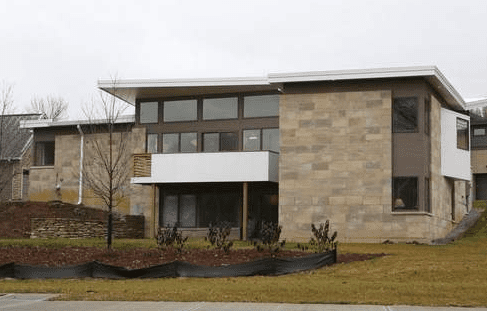 Should their application for LEED platinum certification be accepted – and preliminary LEED accounting indicates it will – they won’t pay property taxes for 15 years. Just a year ago, the couple were living in a 925-square-foot condo in the Bluffs of Devou Park in Covington. Alscher had her studio space, but with Hancock being just 18 months away from retiring from UC, he was going to need his own space as well – and soon. “We needed one more room, but instead we got a house,” Alscher said. Hancock, who is a native Nebraskan with a degree in architecture from McGill University in Montreal, liked that the last available lot in Rawson Farm Lane subdivision sloped toward the setting sun. It gave him the chance to use the climate design principals he taught to freshmen back in the early 1980s. It also provided him a blank slate for using “aging in place” principles that make senior living more comfortable and allow people to stay in their homes longer. Those features include a master suite on the main floor, an unfinished but plumbed caregiver suite in the walk-out bottom level, rocker light switches, foot-controlled floor lamp switches, wheelchair-wide halls and doors (36 inches) on the main floor and roll-in showers. The one staircase is straight and wide, leaving room for a lift if necessary. “The idea is to live here for 30 years and go out in a box,” Hancock joked. In the few months Hancock and Alscher have lived in the home, their 15 350-watt solar panels, which are hidden away from pedestrians by a clever butterfly roof design, have produced 1.97 megawatts of electricity since July. “What happens is that it rolls the meter back – literally,” Alscher said. “It’s a good feeling to open the Duke bill every month. We still haven’t had one in double digits,” Hancock added. Hancock drew plans for the home the old-fashioned way, with pencil on tracing paper from August to October 2012. Once they realized the energy-efficiency potential of Hancock’s design – which he said is somewhat mid-century modern but with definite 21st-century upgrades and tweaks – the couple hired LEED consultant Sanyog Rathod, owner of Sol Design and Consulting, to guide them toward platinum certification. “You have to have a consultant because it’s so complicated,” Hancock said, referring to the engineering and construction as well as the paperwork. If the home surpasses gold and achieves the platinum LEED level, the property tax abatement will go from a maximum of $562,000 over a 15-year period to unlimited. Alscher, who was head of research of the project, said “I didn’t understand any of this stuff initially. It was so complex.” But when all was said and done, Hancock and Alscher’s success was sweet. “When we moved in, we instantly felt at home,” she said. Living space: 2,000 square feet, five bedrooms (two used as studios), three bathrooms with unfinished, plumbed lower level unit for a future caretaker. Outdoor amenities: South facing main level deck, lower level patio. “Green” features: Solar panels on roof, three 250-foot deep geothermal energy wells in front yard, rainwater harvesting system, open cell foam insulation, 1.2 gallon flush Toto toilets.